The decades-long campaign of vilification by some sections of the Irish media against Gerry Adams failed spectacularly as each voter - some, 483,113, in all parts of Ireland - registered their personal support for Sinn Fein, the party he has led since the mid-1980s. Sinn Fein and Gerry Adams are indistinguishable and as far as nearly half-a-million voters are concerned that is fine with them. Their votes made it the largest party in ireland and the largest party in the six counties prompting Gerry Adams to describe the result as a ‘deep-rooted seismic shift’ in Irish politics. It was the power of ordinary people, in the privacy of the ballot box, that demonstrated once again as they have done many times before, that they are not fooled by the black-propaganda campaign against the Sinn Fein president. The electorate saw through the attempts to demonise him, which has grown in intensity since he was elected TD for Louth. The people see beyond the media prejudice. The electorate have a different and more sensible set of rules to assess the president of Sinn Fein than some of those who occupy the editorial boardrooms of Ireland’s media-land. They judge him on what he says and does to improve the quality of their lives. It is no accident that Sinn Fein’s significance as a political party in the south of Ireland really begins when Gerry Adams is elected to the Dail. And that is in no way to ignore the dedication and hard work of Sinn Fein activists over the decades. Its elections results are not an overnight success. And while there is a high profile and competent leadership team around Gerry Adams which includes Martin McGuinness, Gerry Kelly, Mary Lou McDonald and Pearse Doherty, it is the distinctive political and personal qualities of the party president which resonates and which was instrumental in generating the surge of support for Sinn Fein in particular across the south of Ireland. The people know Gerry Adams’s worth and commitment to changing the politics of this island. They know that he, with other republican leaders like Martin McGuinness, brought peace to ireland and have trenchantly defended the peace process while others have tried to wreck it or undermine its importance as an instrument of change within the political system and among ordinary people across this island. The joint stewardship of Gerry Adams and Martin McGuinness and their popularity is creating a new political culture which is replacing the political systems which emerged after partition. It is a one-island political culture which transcends partition and directly challenges the all-pervasive partitionist outlook which is part-and-parcel of the political establishment across the 26 counties and the unionist establishment in the north. The one-party unionist dominated sectarian state in the six counties is gone and has been replaced by a society in transition to equality and justice. The northern executive and assembly operate within an island-wide political context where the Irish government are directly involved in the affairs of the north. 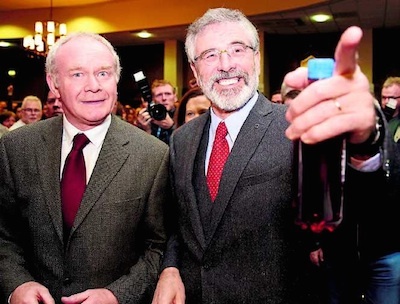 The presence of Martin McGuinness in the 2011 presidential campaign illustrated a vital element of Sinn Fein’s project: presenting to the electorate, statewide, a republican leader with outstanding qualities. In the recent election Sinn Fein’s national message was peace and unity; opposition to the irish government’s austerity measures and equality and an end to sectarianism in the north The message captured the national mood of the people and that is why the party spectacularly won four EU seats and is the largest party in the nation’s capital, Dublin, its second city Belfast and for the first time the largest party on Derry City Council. And, significantly Sinn Fein will be mayor of Dublin and Cork city councils in 2016, the centenary of the 1916 Rising. The election results are the best for Sinn Fein since 1918. They are a confirmation that the much- sought-after republican objective of a realignment in irish politics is under way and that can only result in progress and benefits for all the people of this island.